The letter 'E' is very much on my mind this week. 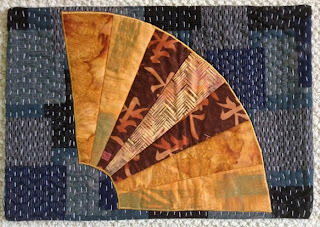 Experimentation - I realized that I never shared my finished challenge quilt for the Art Quilts Around the World Out of Asia theme. As I have mentioned before, I am using these challenges as a vehicle to stretch myself a bit and experiment with new ideas as well as use some techniques that I don't usually use in my art quilts. The experimentation in this past challenge was definitely some hand stitching. Explore - My fascination with hand stitching has grown since the Out of Asia challenge. My dear friend, Margaret Blank, suggested I look into the work of Jan Beaney and Jean Littlejohn. After viewing a YouTube video of their work, I ordered their DVD, 'In Stitches", which is introducing me to many exciting stitches. I expect that I will be exploring this magical world quite a bit in the next few months. Excite - Later this week I will be off to Norway and a trip to the Arctic. We are calling the trip a celebration of our 40th wedding anniversary (actually later this summer). In December 2011 we traveled to Antarctica and so began a fascination with glaciers and ice. It seemed fitting, having glimpsed the southern most region of our globe, to take a peak at the northern counterpart. This is most exciting. I expect to return with many, many photos and totally inspired to continue my series on ice. Since I will be off the internet during most of this upcoming trip, I expect that this blog will be silent till later in June. Hope that everyone has a great month! Judy, your 'Out of Asia' contribution is simply lovely -- not only the hand stitch, but also the colour palate and fabric selection. It's simple, tasteful, elegant. Love it! I have yet to buy 'In Stitches' -- I have 'In Action', which I watch time and time again and always learn something new. Have a grand time on your trip -- and Happy Anniversary!! I agree with what Margaret said about your quilt. I love journeys and adventures and romance so have a great trip. Beautiful quilt... love how you integrated the theme with your subtle color choices and stitches. Hand work is my favorite thing! Hope your travels were fun.